Lake Tahoe Adventures offer snowmobile, ATV, Jeep and ATV Buggy tours in the beautiful Lake Tahoe back country. Drive their ATV’s on the world-famous Rubicon Trail or snowmobiles in beautiful Hope Valley. Lake Tahoe Adventures has been voted the “Locals Favorite.” Book one of their great tours that run year-round and you will be going to places you haven’t been before. Get in touch with your adventurous side at Lake Tahoe Adventures. Discover a winter wonderland at Lake Tahoe. 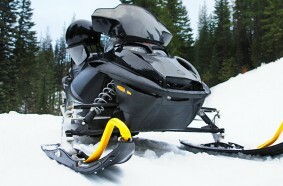 Lake Tahoe Adventures offer easy to operate snowmobiles with no clutches or gears to worry about! You will have a stable and comfortable to drive. For single or double snowmobile riders. Explore the Rubicon or the Nevada’s high desert! Lake Tahoe Adventures offers fully automatic ATV’s with no clutches or gears, with the stability of 4 wheels. For single or double ATV riders. Go riding Baja-style through the high desert! ATV Buggy operates like a standard 4-wheel vehicle except lighter. You can ride side-by-side with a buddy! For single or double riders. Jeeps are an open-air vehicle with big off-road tires and has accomodations for the whole family. Lake Tahoe Adventures offers experienced drivers. Jeeps hold up to six passengers.